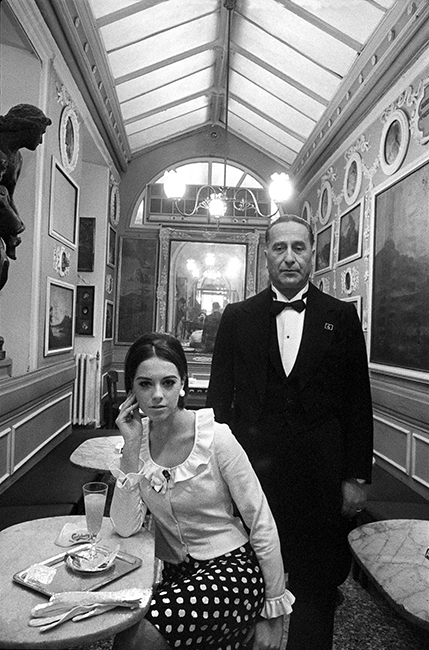 Shot by Duffy in April 1964 for French ELLE in Caffe Greco, Rome. The Cafe Greco was founded in 1760 and the room pictured is still identical today. Situated only a few blocks away from the Trinità dei Monti, the Spanish Steps can be seen in the background of outtakes from the session. Situated on the Via Dei Condotti, it is the oldest bar in Rome. Keats & Byron amongst many others have had coffee at the iconic marble tables. This feature was published on 10th April 1964 in issue No.955. Quote ref: EL_0955_03 if you require press information regarding this image.